While antique pool tables were built to be approximately 10 feet in length, and even earlier versions of the game were allegedly played on tables 12 feet long and longer, the regulation or "standard" size pool table today is only 8 feet in length. Despite its apparent small stature compared to its predecessors, the modern pool table still seems too big for many homes and establishments. For this reason, small pool tables were developed for a hungry consumer market that desperately wanted to play pool in the comfort of their favorite bars or in their very own homes. Small tables generally run at 7 feet in length, but that single foot of difference often seems to make ALL the difference for the pool table owner. 7ft pool tables are often found in bars on account of their space efficiency. Smaller pool tables mean most patrons have plenty of room to mingle in, without impeding on the fun of pool fans and pool players. The small size of these tables also means that more can be fit into a single area, so more than one pool game can take place, satisfying a larger number of bar patrons who just want a quick game of 8-ball or cutthroat. The tables you commonly find at a bar are often of the coin-operated variety. Of course, if you are in the market for a home model, you won't need to worry about that clunky undercarriage. Small pool tables, aside from being proportionally scaled down, are pretty much identical to regulation pool tables. They come with full runners and net pockets for easy shooting and retrieval. Additionally, they are constructed in very sturdy hardwoods such as oak, poplar, ash, mahogany, cherry, maple, and teak. Each of these woods has its own distinct color and artistic flavor, and each one will have a unique aesthetic impact on your home's aesthetic. Unfortunately, these woods are not normally available in a variety of colors. Tables that use wood laminate cannot be stained or painted, either, as this may damage the wood or aversely affect the sealant. Small pool tables are fantastic for homes with limited space. They fit well in any study or lounge room, and often accommodate the full length and stroke of the pool cues (meaning an end to obnoxious bumping and scraping into walls). If you're going to invest in a small pool table, make sure that you are buying a quality product. Make sure that your table is outfitted with genuine pool felt, as this will greatly affect the amount of friction on the table; friction, of course, can greatly affect game play. 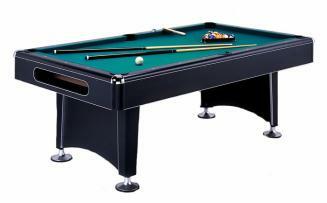 Ultimately, with a little online searching, you will surely find the perfect small pool table for your drawing room. They come in a number of styles and designs, so be sure to go with one that matches the theme and beauty of your home. And enjoy the billiards!